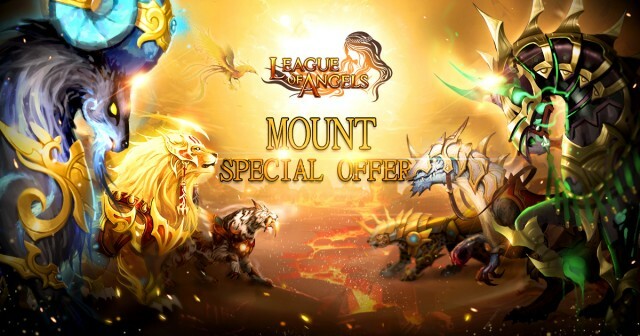 League of Angels: Enjoy the Mount Special Offer in April! Most players know mounts are an integral part of League of Angels. They provide crucial stat bonuses, mighty buff skills, and most importantly, they look awesome! Now League of Angels is excited to provide a Mount Special Offer event in April, to give everyone a chance to take their mounts to a whole new level! During the month of April, every 5 days a new Mounts Hot Event will be available! Each event will have 4 different Mounts on sale and you can choose to purchase any 2 at a significant discount! In short, we are going to have a lot of Mounts FOR SALE throughout this month! Pretty exciting, isn't it? So be sure to keep an eye on the hot events to see if the Mounts that you are wanting have been added to the special offers. Plus, League of Angels has also prepared a series of fantastic events where you can dress up new fashion and gain hot items at the very start of April! Check Happy Sea for the new Devotee Costume and Fairy Exclusive to take cute elfins into your party! We hope players will enjoy the new events and look forward to more great content in the future. League of Angels is a free MMORPG featuring intense combat and beautiful visuals, making it one of the best online games in its genre and awarded “Best Browser MMO of 2015”.